According to editor Jamie Durrant "The world is your oyster and Essentials is keen to do the shucking for you!" What is Essentials magazine? Who is it for and what does it cover? Essentials Magazine is about appreciating the best life can offer, delivered by good people who work hard to build a worthwhile lifestyle and who want you to share their experience. When you read Essentials you take part in a journey of discovery and share the writers’ passion for the key ingredients of a great life: family, friends, food and wine, art and the spirit of community that strengthens humanity. Essentials’ mission is to help you reflect on the simple pleasures that make life special. Its editorial team is based in Victoria but its outlook and reporting is global. 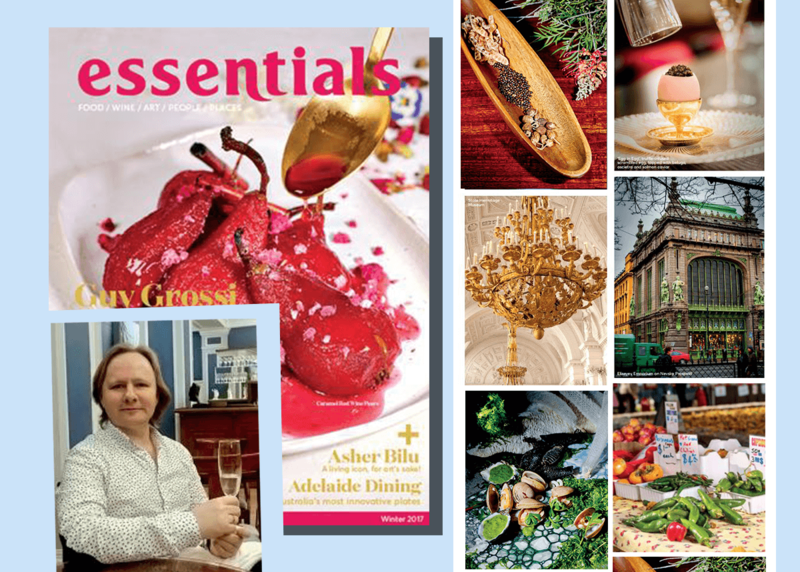 How do you decide on what Essentials magazine will cover in the industry of wine & food, travel and culture? Australia’s food and wine industry is diverse and extremely fluid. Culturally we’re fast adaptors to new concepts and love trying new things. Essentials connect readers with the latest creative food and drink trends and innovations via its continual communication with industry food and wine professionals. So in essence, it’s word-of-mouth driven, shared communication. We listen to a lot of mouths, and we’re good at communicating the words that matter most! For the current Australian issue of Essentials we teamed up with online farmer’s market Farmhouse Direct and a range of Australian native food producers. With their unique ingredients we’ve put together s series of indigenous inspired recipes. This has proven to be not only be highly educational, as it showcases new foods such as Davidson Plum, bush tomatoes, coastal herbs and more, but it turned out to being a delightfully flavoursome tasting opportunity. I recommend this article to any foodie who’s keen to understand what real indigenous foods are now readily available to purchase, and how to cook with them. Have you noticed a trend in the food industry with more dishes featuring native Australian food? Why do you think there has been a movement towards Australians looking in their own backyard? Many high end restaurants such as Dinner by Heston Melbourne and Orana Adelaide (featured in the current issue) have taken inspiration from coastal herbs and native foods based on a world-wide trend of foraging for fresh local ingredients - with the origins conceptually being about having a food connection with your local environment, and being acutely aware of your natural surroundings. In many cases the forraged food ingredients can be found in abundance, are sustainable and better still: are free for picking! I also believe this trend has grown from the New Nordic cuisine movement - a food style that perhaps kicked off the focus on sustainable local foods. What are your top 3 favourite native Australian foods and why? 1. Bush Tomatoes: They’re easy to cook with, rich in a umami flavour. They add a sweet subtly spiced flavour to just about any dish - great with scrambled eggs - who needs truffles! 2. Beach Bananas: These coastal herbs offer a natural soft saltiness and textural crunch. They’re beautiful as a garnish for seafood dishes and salads, and add a unique refreshing edge. 3. Finger Limes: The bright acidic sweetness of these natural wonders add a luxurious texture and taste to both desserts and savoury dishes. And they’re fun to squeeze open. Native Australian brilliance! What's the best part about being the editor of Essentials Magazine? Meeting people and seeing new places. Being a magazine editor can often prove a very good excuse to meet the most talented and creative people living in the most wonderful places. Listening to their life experiences and sharing in their knowledge is a privilege. Always there is pleasure in exploring there local landscape; whether it be rural or urban. What can readers expect from future issues of Essentials? Readers can expect to be both educated and entertained by future issues of Essentials. We’ll be focusing on sustainable foods and foods and recipes designed for greater health, plus new innovative ingredients and a continued look at time honored healthy food preparations. They’ll also be fun also: Reports on where to eat, what to drink and which travel experiences prove the most culturally daring and/or luxurious. If it’s bucket list brilliance you’re after, Essentials promises to deliver on the top tips of what to explore and where. The world is your oyster and Essentials is keen to do the shucking for you! If you fancy a free issue of the latest edition of Essentials simply be one of the first 20 people to enter your address details HERE! It's that easy.